This job candidate was well-versed as a freelancer lawyer, law clerk, and legal assistant looking to find a more lucrative and permanent position within a practice, which would eventually lead to a partnership after passing The Bar Exam. 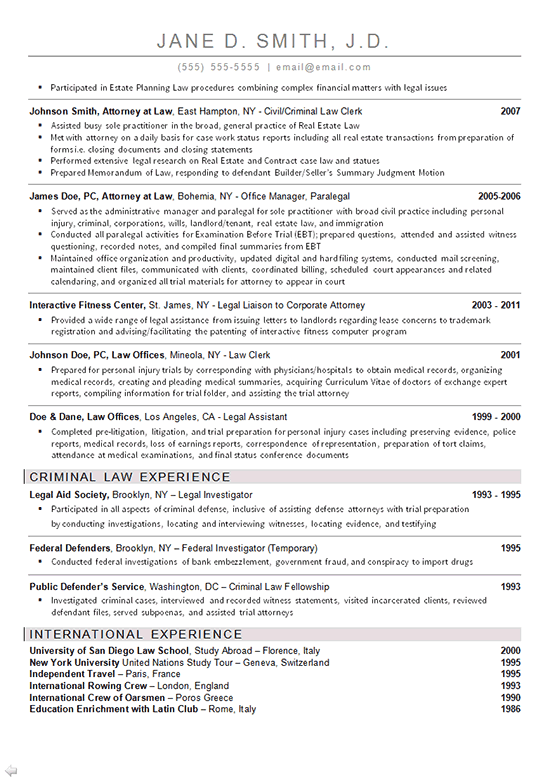 The main challenge with this resume was condensing multiple instances of very similar experience onto two pages. 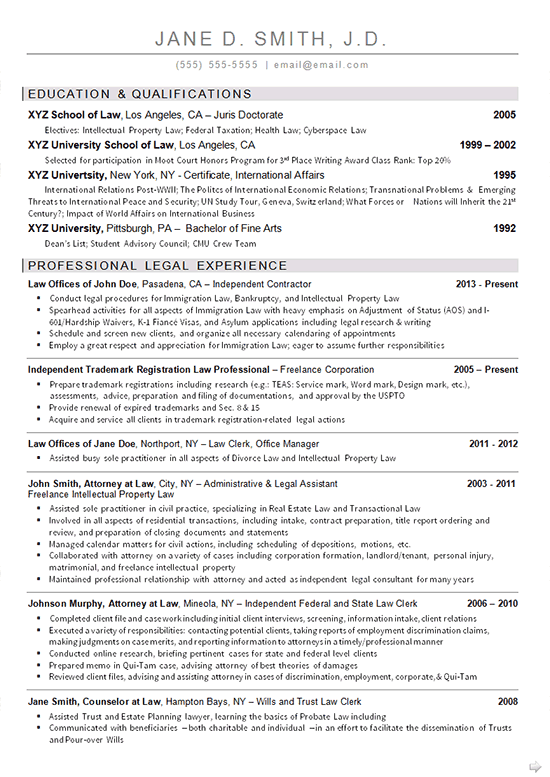 The reason many of the examples were included on the resume was to demonstrate the areas of law the candidate has experience in. Communicating law jargon in a somewhat legible fashion is definitely a challenge in which we attempted to keep as simple as possible. The most important aspects of this resume are the Education in Property Law and Professional Legal Experience sections, which qualify the candidate for a similar position. The other challenge we faced was masking the fact that the candidate has had many different roles for shorter periods of time. This can be attributed during an interview to the candidate’s traveling lifestyle. In developing the resume, a clean, yet appealing template, was necessary to deliver a stand-out document. In an effort to make the experience more digestible, we separated the Criminal Law Experience into its own section, as well as International Experience, to demonstrate the candidate’s love for travel, learning, and interacting with other cultures. Prepare real estate and property cases for trial. Create and modify commercial leases, access agreements and indemnifications. Review related loan documents and related financing agreements. Develop policies and procedures for the law firm. Respond to liability claims and prepare motions for defense.